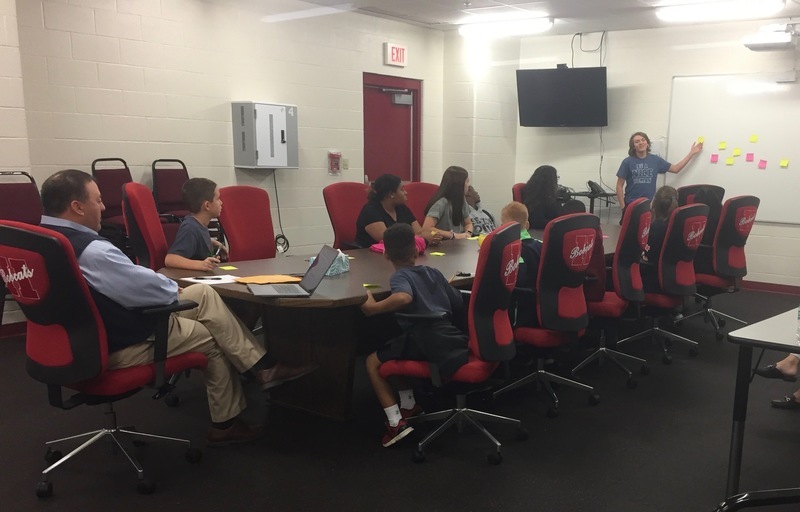 HOPE – Teams from the campuses of the Hope Public School District engaged some imagination to recognize similarities across age levels and to develop concepts of campus images in the second meeting of the “Student Voice” district committee. Hope Superintendent Dr. Bobby Hart facilitated the session at the Hope High School MAC Center with a series of questions to the students and comparative discussions. The exercises were designed to demonstrate strengths and challenges from a personal perspective that helped the students discuss campus life. Hart asked for reasoning about choosing a new name if the students were given the opportunity, and simplicity and ease of pronunciation were clear winners. Family members were key answers regarding a personal hero. Hart said the exercise helped students understand how they can work together to effect improvements in life, which led to a discussion about key attributes of each campus. “Even the smallest student’s voice matters,” Hope High School representative Roger Hall said. Consensus descriptions included “challenging” for Clinton Primary School and Hope High School; “busy, active” for Yerger Middle School; “fun” at Beryl Henry Elementary School; “intelligent” at Hope Academy of Public Service; and, “success oriented” at the Hope Collegiate and Professions Academy. Answers ranged from “one big building” and “inside football field” to “feel like home” and “a place to get away (problem free)”, as well as points about the generational student complaint: the cafeteria. “I enjoyed talking about our school,” Clinton Primary representative Riley B. said. Clinton Primary representative Cayden B. emphasized the point from the lunch meal provided to the committee. “They had good food,” Cayden said. Comments on campus food service ranged from “mini corn dogs – back on the menu” to “commercial food vendor (McDonald’s, Subway)” and “bigger portions at HHS” to the length of time for lunch and lunch lines that are too long. The group will meet again in December.